Ft. Meade guard tower. 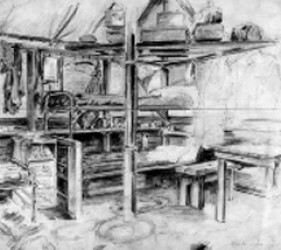 Image from original drawing by German internee Paul Lameyer. Courtesy his grandson, Randy Houser. 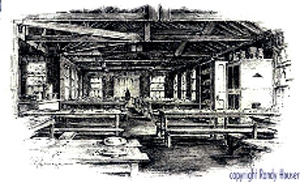 Ft. George Meade was a US Army military post located southwest of Baltimore in Anne Arundel County, Maryland. It apparently served primarily as a temporary detention site for German, Italian and some Japanese internees before they shipped to other locations. Reports indicate that the peak population in May 1942 was over 350. 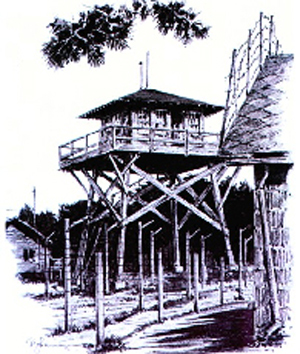 Internees were treated as prisoners of war and issued green government khaki. 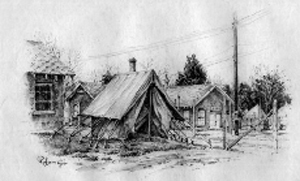 Dr. Heitmann continues: They were housed in 4-man tents, several of which routinely flooded after heavy rains. Barbed wire, “off limits” signs, and machine guns surrounding the prisoners completed the scene, along with guards who viewed these men as potentially dangerous,” enemies of the American people. At least one incident was reported in which soldiers shot into the internee barracks. There was a large FBI presence. 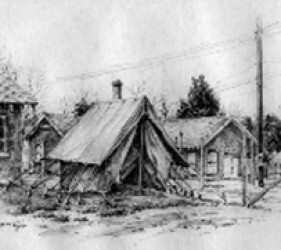 Ft. Meade Tents by Paul Lameyer. Courtesy his grandson, Randy Houser. 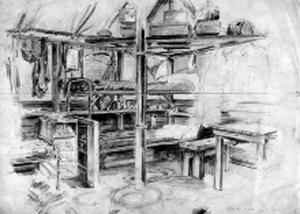 Ft. Meade Tent Interior by Paul Lameyer. Courtesy his grandson, Randy Houser. 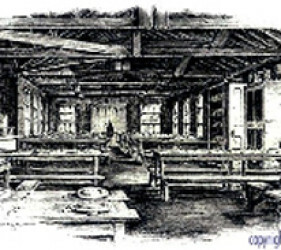 Ft. Meade Dining Room by Paul Lameyer. Courtesy his grandson, Randy Houser.